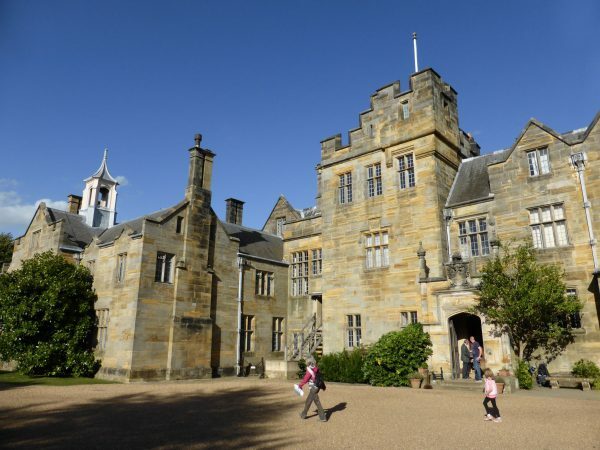 Our destination today is Scotney Castle which is not far from Waghorn’s CL. We consider walking there but looking at the map note we would have to walk besides the A21, we are unsure if there is a pavement or wide verge, so instead make the short drive. Being a fine autumnal Saturday there are plenty of cars in the car park this is obviously a popular spot. We decide that a walk around the grounds should precede visiting the Castle and head off on the Parkland Trail. Following the way-markers we are soon walking along the old carriageway. Apparently this was the original route for horse drawn carriages arriving at the castle, however, the uphill drag meant the horses looked tired on arrival so the entrance was altered so that they could come downhill. We cross a couple of bridges (Sweetborne Bridge and Bewl Bridge) and soon after the Parkland Trail turns left. Being only two miles we think this is too short a walk for the dogs so decide to combine it with the one and a half mile Woodland Trail, so carry on into (you’ve guessed it) the woods. It is easy enough to follow the route and whilst clearly marked on the estate guide it does not follow footpaths on the OS map. The route gradually climbs uphill but soon after a clearing descends back towards the parkland walk. We are enjoying our walk through the woods and so when we meet a junction way-marked for the Hop Trail we turn right along this new trail to extend our walk further. This goes through the bottom of woodland and then on joining a track turns right and starts to climb. We are busy chatting and then realise we have not seen a way-marker for a while. We see a footpath sign and looking at the map see this will lead us to Kilndown. We are jamming about so decide that we should have a look at the village. On reaching a minor road we turn right and walk into Kilndown passing the Globe and Rainbow pub. As we carry on into the village we pass two houses The Globe and The Rainbow, I start to wonder if there is a theme running through this village! 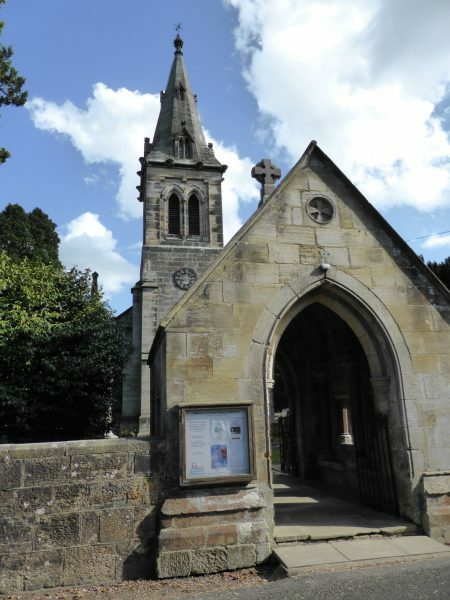 However, a later look at the informative Goudhurst and Kilndown History Society website reveals all. 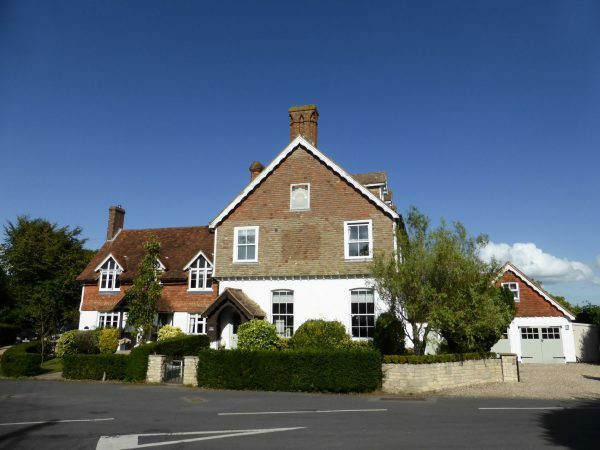 It would appear that originally these two houses formed the White Hart pub, when Alexander James Beresford-Hope purchased the Bedgebury Estate it included the White Hart. The name was changed to the Globe and Rainbow because both were contained in the families’ coat of arms. In 1996 the pub fell on hard times and was sold to a developer, the two houses were converted into The Globe and The Rainbow. Thankfully in the garden a pub was built, initially called Rainbows End (an apt name for a declining pub) but now renamed the Globe and Rainbow it is said to be a key part of the community. Our next port of call through the village is the Quarry Centre; this reminds me of the building that preceded the current village hall in my home village. In my village it was known as the ‘Reading Room’ and made way for a more modern village hall. In the case of the Quarry Centre the old site was gifted to the village for a neat wooden building. 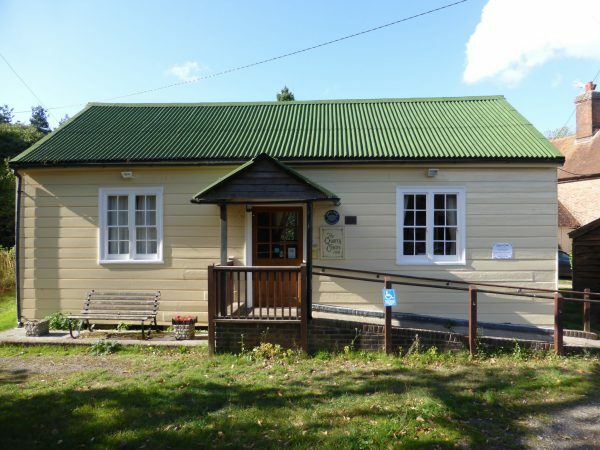 It was known as the Kilndown Club and Institute and was used as a recreational reading room and working men’s club. In 1980, 100 years after the initial construction it was renamed the Quarry Centre. The name chosen because the pond next to the building was created when stone was extracted to build the village church in 1841. 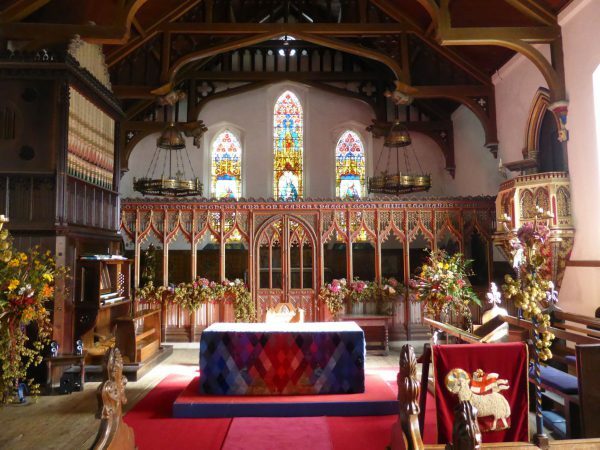 Christ church is just a few yards up the road and has been built in a gothic style. Inside it is very ornate and decorated with flowers and hops, we are not sure if this is for harvest festival or a wedding. Resuming our walk we turn back along the road towards the Quarry Centre and after passing it take a footpath on the left that leads into Kilndown Wood, after a couple of hundred yards we are back at the clearing on the Scotney Castle Woodland Trail and turn right to follow this downhill. This then leads us into a field of bears. Lynnie says they are National Trust bears (so apparently harmless). The route has now joined the Parkland Trail and we follow this around the estate to reach Scotney Castle and decide to wander around the gardens. 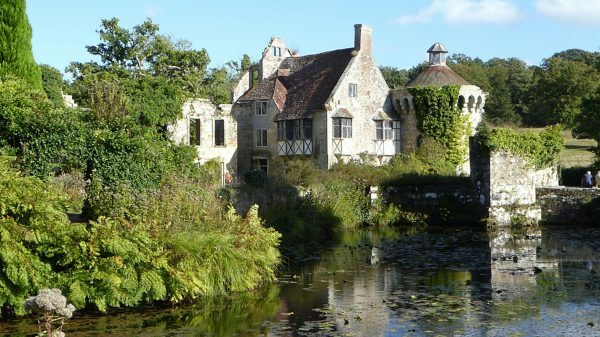 There are two fine buildings, Scotney House and the ruins of a medieval moated castle that has undergone many additions and changes over the centuries. The house was built around 1836 by Edward Hussey III from sandstone quarried from the grounds of the old castle. It stands at the top of the grounds and has fine views around the park. 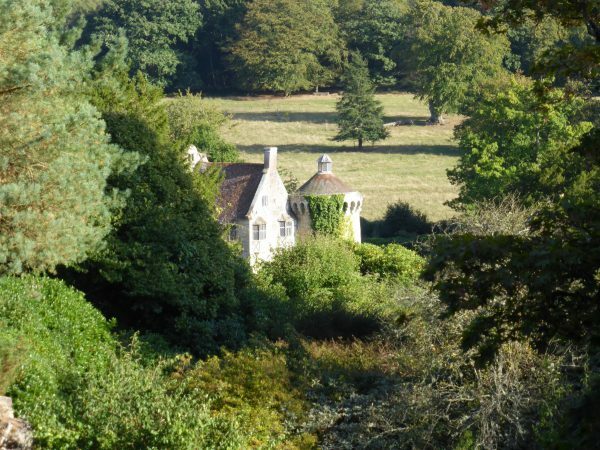 The castle is very picturesque; it had been the Hussey family home for a number of generations and after moving out Edward decided to deliberately wreck it to create a folly in the gardens of his new home. 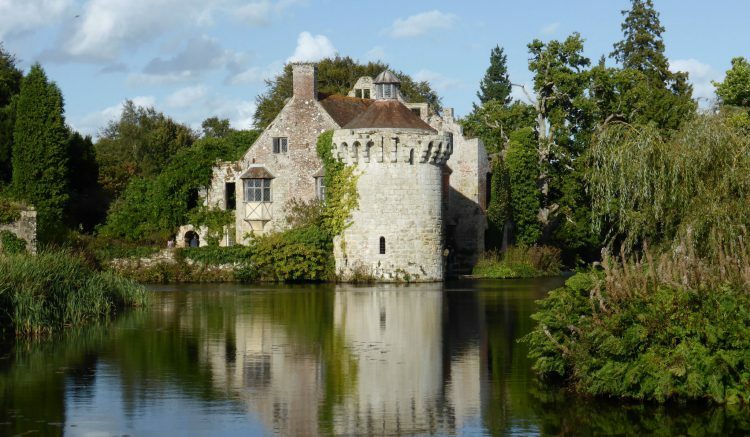 The original castle was built around 1378 by Roger de Ashburnham as part of the defenses against the French. I wait outside with the boys whilst Lynnie goes in to explore. It is pleasant standing in a sheltered spot in the warm autumn sunshine. 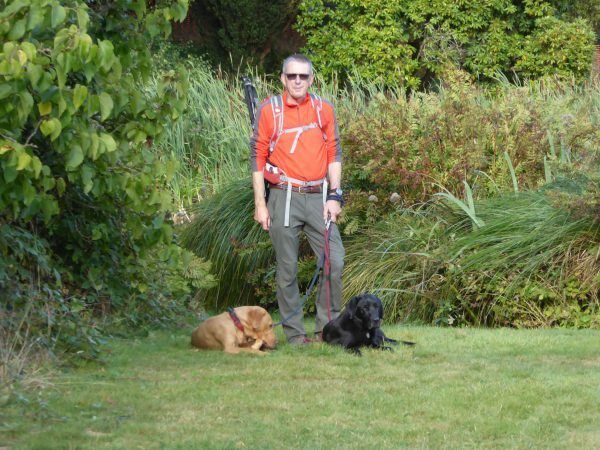 The boys soon settle down for a sleep, when we are travelling they are never sure how far they are going to be expected to walk, whether they are half way or near the end. So every opportunity for rest is taken. From the castle we wander around the moat. Lynnie is exercised because a family is feeding white bread to the ducks, of course this is not at all good for them and can be fatal. 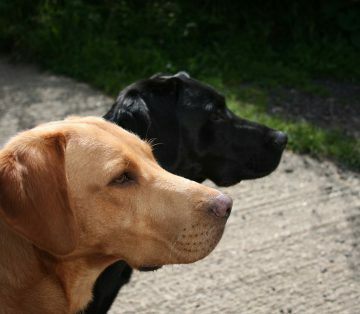 Lynnie thinks there should be information signs alerting folk to the dangers of their misguided feeding of wild fowl. 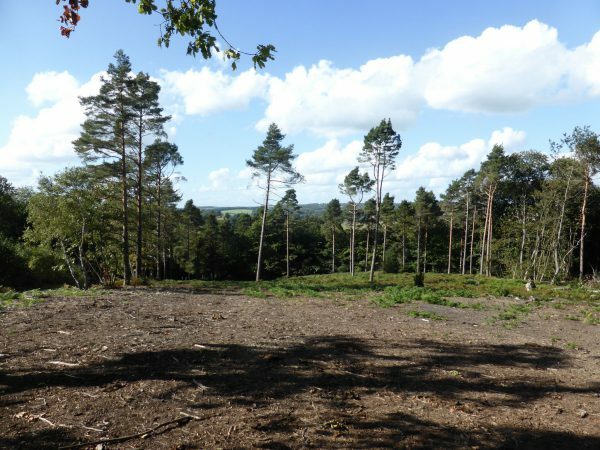 After all this is a National Trust property and surely they should be a paragon for maintaining wildlife. 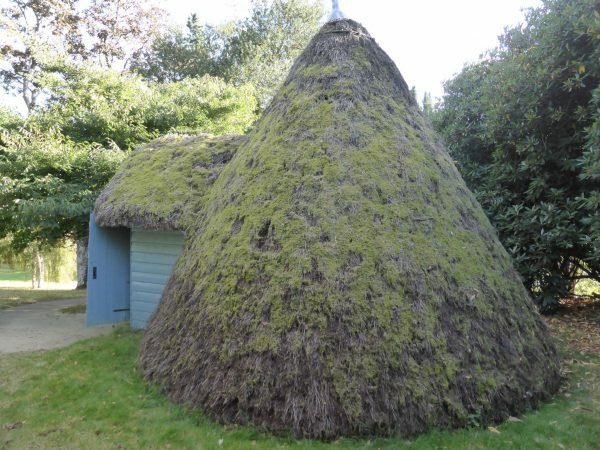 Wandering through the grounds we reach the old heather thatched Ice House. Built in 1841 and now a grade II listed building the ice house would have been the equivalent of the modern day refrigerator. Ice was collected from around the estate during the winter and apparently lasted the whole year. Our sauntering has covered just over four miles. It has been both interesting and enlightening. It is time to head back to the van and start packing up for moving on tomorrow. 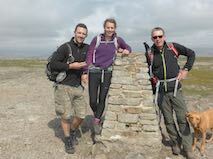 We have thoroughly enjoyed our stay on this part of the East Sussex / Kent border and will definitely return next year.